What kind of voodoo is he using? He has been in the league for 10+ years and he hasn't done **** yet....the media keep giving him a pass ....this clown qbing is as stale as blue cheese. sanka wrote: What kind of voodoo is he using? The Media is giving him a pass? He's probably the most scrutinized starting QB in the league and has been for almost a decade. To answer your question, he parlayed some good short-term numbers and some desperation by the Bears into a very onerous contract that's been very difficult to get out from under. Then the Bears hired John Fox, who (left to his own devices) his one of the least QB-centric coaches in the league. He built an NFC powerhouse with Jake Delhomme for crying out loud. So replacing Cutler hasn't been a high priority for him yet. Also, he wasn't bad last year in a conservative attack, though with Adam Gase gone we'll see if that lasts. He's better than George ever was, though George had the strongest arm I've ever seen. I don't think Cutler is a bad quarterback. But between being a first rounder, being traded for TWO First Rounders, and getting paid franchise QB money, you expect more than he's ever been capable of. 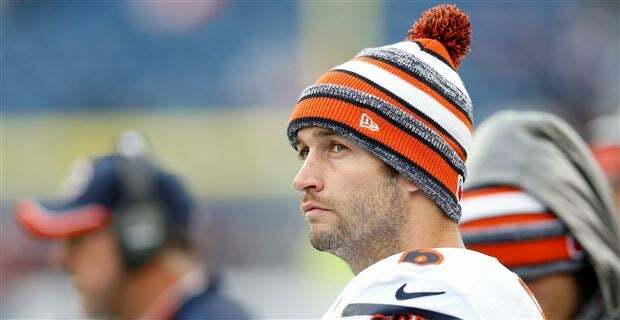 In a perfect world, Jay Cutler is someone like Derek Anderson, spending a decade as a rock-solid backup. Are you finished with your excuses? There is no qb in the league that has had more head coaches and offensive coordinators than Cutler. Maryjane we saw this movie before....just last season...we all know how it will end ....at least the Cowboys learnt their lesson investing in a young Qb in the draft....and not to put all their eggs in one basket. Last edited by sanka on Fri Sep 16, 2016 11:17 pm, edited 1 time in total. I don't think he's that bad either. You can do a lot worse. Maryjane we saw this movie before....just last season...we all know how it will end ....at least the Cowboys learnt their lesson investing in a young Qb in the draft. And perhaps that is the problem, Sanka. Remember when Alex Smith was a bust? He literally had a new OC every season his 1st 5-6 seasons in the league. Stability is an underrated concept in the NFL. WHERE DO YOU SEE AN EXCUSE IN MY POST YOU MOUTHBREATHER? Do you even read the posts you respond to? Given the fact he's had so many HC's/OC's lately don't you think that would be a major inhibitor towards his success? Every time the Bears REALLY hit their stride Cutler would go down with a major injury and it happened at a time when the Bears had come off a NFC Championship game and were poised to continue their Super Bowl push. But chalk that up to Chicago's inability to provide Culter with a better offensive line. They paid the price for it by getting their QB killed over and over again for 3 years straight. After a certain point it became unacceptable and Lovie took the fall for it. Once he was gone the Bears have been a carousel of nonsense. If you HAVE to knock Cutler it's that his career playoff victory came against the notorious 7-9 Seahawks. But I'll be damned if the guy could ever get to the playoffs again once in a string of 8-8, 10-6, 8-8 seasons that all should've seen the Bears win 11+ games. But it never happened because he would be killed and miss most of the last half of the season due to anything from lower body injury to concussions. People are entitled to say whatever they want about Culter but I'll be damned if anyone else in this league has taken the beating he has. 10 Seasons. 0 Super Bowls. 10 Seasons. 0 SB Appearances. 10 Seasons. 1 Playoff win as you mentioned above. 10 Seasons. 5 Head Coaches. 10 Seasons. ≈ 6-7 Offensive Coordinators. 10 Seasons. 0 Top-100 player ranking votes. I'd just like to use this opportunity to point out that I picked John Fox as the first coach fired this season in the thread we had about which coach will be fired first. Jay Cutler is a legend when it comes to killing coaches. He shouldn't be a starting QB, if for no other reason than his infuriatingly weak chin. Bears havent been a good organization in 10 years. Coaching Carousel. Cutler is an average qb getting paid a **** ton of money. Bad upper office who cant seem to grasp the fact they made a mistake and have decided to draft around this guy rather than replacing him. the whole thing is at fault, including Cutler. Been 12 years in the league, made the playoffs once. And in the NFC title game got hit a few times and sat out with a "sore ankle". Dude is soft, a turnover machine, and doesn't really give a **** either way. He's the polar opposite of a Winston on his will to win. That was one most the forum got right. We were almost all against taking Cutler down here in Tampa. I haven't regretted that decision yet. Are you saying that they'll be better with Brian Hoyer? MJW wrote: Are you saying that they'll be better with Brian Hoyer? I'd say yes. Just about anyone would be an upgrade. And before you throw a lot of numbers my way I just don't think Cutler is much of an inspiration to anyone other than his agent. That kind of body language, "leadership", not to mention his contract, all those things are a big drag to the Bears organization. An injury that forces the Bears to move on would be the best thing for them in the long run, they obviously lack the smarts to see it. You buy it and I'm all in. LIFE'S TOO SHORT TO DRINK BUDWEISER!!!! NFL is a joke...why are people so over sensitive today?